The Spanish Civil War is edging towards the far horizon of living memory. There are no more than a dozen veterans still alive. They include Fernando Macarro Castillo, better known as Marcos Ana, a poet who signed up with the Republican Army and later spent twenty-three years in one of Franco’s jails. He is now 96 years old. And José María Gárate Córdoba, who fought on the Nationalist side and went on to be a military historian. He is 97. Or the Englishman Stanley Hilton (now living in rural Australia) who, at nineteen, jumped ship in Alicante and joined the International Brigades. He, too, is 97 years old. No doubt there are others who were only children at the time, indelibly marked by the first “total war” to be fought on European soil, in which civilians were directly targeted as in the infamous bombing of Guernica. But there cannot be many left. Next year there will be fewer. Very soon there will be none. And then the conflict will have passed fully into history. But history has a way of catching up with us. Live Souls (Ronsdale Press, 2015), a collection of photographs (plus brief memoir) by Alec Wainman, who served in Spain as a volunteer ambulance driver and interpreter, is a reminder that the past is nearer than we think, the repercussions of this internal conflict broader than we might imagine. For the struggle between Franco’s insurgent Nationalists and Spain’s legitimate Republican government was always an international affair, as the former were enthusiastically backed by Nazi Germany and Fascist Italy, Mexico and the USSR weighed in for the latter, and the rest of the world watched on and waxed sanctimonious. In some ways, the war of 1936 to 1939 was a dry run for the subsequent World War Two, as what would become the Axis powers tried out novel tactics of aerial bombardment and mass terror, while the true stakes of Allied anti-fascism were laid bare: the UK and France (among others) chose not to intervene where they felt their national interests were not at stake. In frustration and anger, thousands of (mostly) young men such as the Anglo-Canadian Wainman, fresh out of a Modern Languages degree at Oxford, travelled to Spain to help in any way they could, believing that the Republican cause transcended national boundaries. But the global impact of the Spanish Civil War is not measured in geopolitics alone. The Republic’s defeat prompted a diasporic exodus of its adherents: throughout Europe but also to many countries of Latin America. And those who had fought alongside them also ended up at all four corners of the world: Stanley Hilton in a remote town on the border between Victoria and New South Wales, and Wainman on what must have seemed the equally isolated Canadian Pacific Coast, about as far away from the battlefields of Madrid, Catalonia, and Valencia as one could imagine. Here, in Vancouver, he dedicated himself to teaching Slavic languages and culture at the University of British Columbia, apparently telling few of his friends or colleagues of his experiences back in the heady days of 1937 and 1938. He died in 1989 and his archive of 1600 photographs taken in Spain with a trusty Leica was thought lost until, very recently, his son (who goes by the name of Serge Alternês) tracked them down, salvaged from the home of a retired London publisher. Now available, together for the first time, in this handsome volume, these images chart the tenacious persistence of memory, the resonance of surprisingly intimate encounters that radiates outward from then to now. With few exceptions, almost all these pictures are portraits. The first, indeed, is the figure of the photographer himself, snapped close-up (a “selfie,” perhaps?) on a Barcelona street car. His head is back, and he looks somewhat warily at the camera lens from behind glasses that reflect the light from the street and so render the photographic subject slightly opaque, reticently fleeing our gaze. Equally, another photograph that features Wainman, in his khaki shorts, leaning on the bonnet of the ambulance he drove, is strangely out of focus and blurred. This is a portraitist who happily effaces his own image and subjectivity in order all the better to let those portrayed fix their own self-representation. On the page facing the picture of Wainman with his ambulance, for instance, is an image of John Cornford, the British Marxist poet whose “Full Moon at Tierz” and “To Margot Heinneman” are classic meldings of politics and romantic elegy. To add to the mythos of doomed romanticism, Cornford famously would go on to be killed in action at twenty-one. But in this picture, he’s perhaps surprisingly smiling, raising his fist in a salute that seems almost comic, self-consciously humorous. Wainman’s portrait opens up a perspective that goes beyond the time-worn cliché. And so it is throughout the collection. We perpetually get the sense of a curious eye that lets itself be drawn by its surroundings and by the dispositions of those who are facing the camera. In nearly every case, the people we see are aware that they are being seen, and so participate in their self-representation. The cover image is another good example: it shows what appears to be a veteran militiaman, with an ammunition belt over his shoulder, amusedly looking at us with half-closed eyes as he takes a drag of a cigarette, while next to him a younger man, barely out of adolescence, extravagantly strikes a pose with his fist in the air. Behind them, a small crowd cheerily look on, observing this to-and-fro between photographer and his subjects, self-fashioning and its capture on film. The glory of this book is not that it shows us its varied array of combatants, volunteers, nurses, patients, peasants, children, and so on as they actually are, but rather that it allows them to show themselves as they want to be seen, devoid of any particular propagandistic intent. Hence perhaps the book’s title. The “life” of these live souls comes through in the poses they strike, and in the freedom that the photographer gives them to strike them. If this is a claim to authenticity, it is so in that it is the record of a series of interactions: the truth of the encounter, of bodies that meet and become subjects through the medium of the camera gaze. The very last image, for instance, is of a young girl in the Basque country in 1939, at war’s end. She stands in front of a laden donkey, her head slightly bowed, her feet a little askew, one arm behind her back but the other (she hopes) almost nonchalantly balanced on the basket by her side. With a broad smile she looks directly at the camera. Here I think the caption gets it wrong in stating that “life remained the same as before for those children who were not orphaned or evacuated.” How could it? But what we see, in all the tension between the awkward pose and the beaming face, is the determination that, despite everything, life will go on. And this book, too, is the product of a similar determination: that even as the past slips into history, as memory becomes unreliable and at best second-hand, the soul of Republican Spain should continue to resonate into the future. Reposted at The Volunteer, the journal of the Abraham Lincoln Brigade Archives. Reposted also at The Tyee, as “As Europe Roils, New Glimpses of Fighting Fascists 80 Years Ago”. 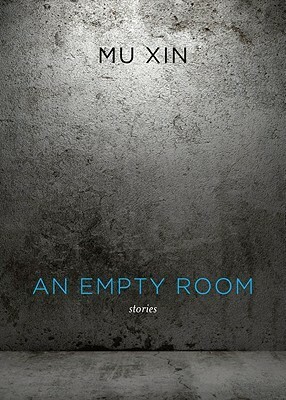 The title of this collection of short stories by Mu Xin is well-chosen, for this is narrative that is sparse and under-stated, sometimes to an extreme. It would be easier at times to detail what doesn’t happen in these tales than what does, for there is a constant sense of missed opportunities, missed connections. In the opening story, “The Moment Childhood Vanished,” for instance, a child coming home from a trip to a Buddhist monastery leaves his bowl behind. Someone runs to fetch it, but then the child drops and loses it forever in a river. The title story, “An Empty Room,” recounts the discovery of a room that turns out to be almost, if not quite, empty: strewn on the floor are letters that seem to reveal a love story that can’t quite be fully pieced back together. “The Windsor Cemetery Diary” concerns a fleeting and uncertain dialogue between two people who never meet and communicate only by turning over a penny in an otherwise abandoned graveyard. As the narrator notes at one point, “I put these thoughts in my diary to show that there is nothing to be recorded” (134). Little to nothing happens, but it is precisely this nothingness that is to be memorialized and pondered. And of course the room is not completely empty. In the story of the same name, there are traces of some other narrative, even if it can never be fully reconstructed. Or in the cemetery, the periodic flipping of the coin is sufficient basis on which an entire series of hypotheses can be constructed. And even if one day the coin were not to be flipped, that too would send a series of possible messages, such as “I am dead. I have completely forgotten you. I do not come anymore” (140). It is as though Xin were asking what is the minimum material element of a signifying system, the degree zero of signification. Yet he also teases us with the prospect that there might be more, that there might be a whole hidden script that might one day unfold. “Quiet Afternoon Tea,” for example, tells the tale of a long-married couple apparently plagued by an untold story, of what happened–or didn’t happen–one day (the date and time are quite precise: October 26th, 1944, between three and seven o’clock) some forty or fifty years previously. The couple’s niece seems to think that this is a story that has to be told, for the benefit of her uncle and aunt alike, and does everything in her power to engineer a cathartic dénouement. But nothing happens: she leaves the two of them alone, and “there isn’t a sound” (91). It’s as though the pair are in fact perfectly content for the mystery to remain, or even that it’s precisely what remains unsaid, not what is said, that keeps them together. It would be easy, no doubt too easy, to ascribe this pared-down tone to some kind of Asian reserve. Indeed, at times Xu seems to play on the notion of Buddhist self-abnegation: one story (“Fellow Passengers”) compares us to pipes “through which both joy and sadness flow. A pipe with all sorts of emotion flowing through it until one’s death or until it is emptied” (97). It ends with the dual assertion: “They are insignificant people. I am less than insignificant” (98). And yet there is a fascination with the almost ethereal traces left by such insignificance, traces that ultimately signify almost despite themselves, despite our shared hollowness or emptiness. In “Halo,” then, there is a lengthy discussion of the iconography of saintliness, in both Western and Eastern cultures. The Western halo, we’re told, is “false and awkward,” a “flaw [. . .] so embarrassing that it further inspires the eloquence of atheists” (108). The Eastern halo, by contrast, is more than mere pictorial “decoration” (112); it derives from an “internal calmness bordering on the state of sainthood” (110). Once the prisons were emptied, then, the halos would remain, a ghostly but absolutely material trace that can only point to, never fully encapsulate, an entire history of power and something like resistance that goes beyond words. And when the sculptor finishes his tale, “We raised our glasses. Why we didn’t quite know why we needed to empty the glasses, we emptied them anyway” (116). Mu Xin shows no great nostalgia for the fuller description and understanding that is inevitably lost; he knows them to be irrecuperable. Such is the way of the world, the effects of time and history. But even in their inevitably incomplete, precarious state, the traces of these broader histories deserve some acknowledgement, perhaps celebration, though we may not exactly know why. 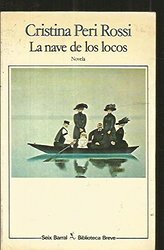 The cover of Cristina Peri Rossi’s La nave de los locos features an image by the German/American artist Jan Balet. It’s a rather austere composition, of a small and apparently over-loaded rowing boat carrying three women, one middle-aged man, and a child, plus a younger man who has hold of the oars. Fortunately, perhaps, for all concerned, the surface of the water itself is smooth as glass, and two of the women are standing up in the tiny boat. But as a result, the arrangement strangely lacks almost all movement: the figures awkwardly stare out at the viewer as though from a formal portrait. Moreover, the composition is also practically devoid of colour: water and sky merge in a murky haze of grey, and all the adult figures are head-to-toe in black (the women, with long-sleeved and high-necked dresses plus extravagant featured hats), as though they were in mourning. The child, meanwhile, is dressed in white, but this only serves to accentuate her enormous dark eyes, which seem to be less organs of sight than black holes sunk deep into her face. As a whole, the picture’s ambience is macabre and disturbing. This is no happy family outing, but perhaps a snapshot of the Victorian bourgeoisie slowly crossing the Styx to some prim and proper Hades. The choice of Balet’s painting for the book’s cover brings out some of the themes contained within: the notion of forced voyages, for instance, or of melancholy resignation and shared solitudes. 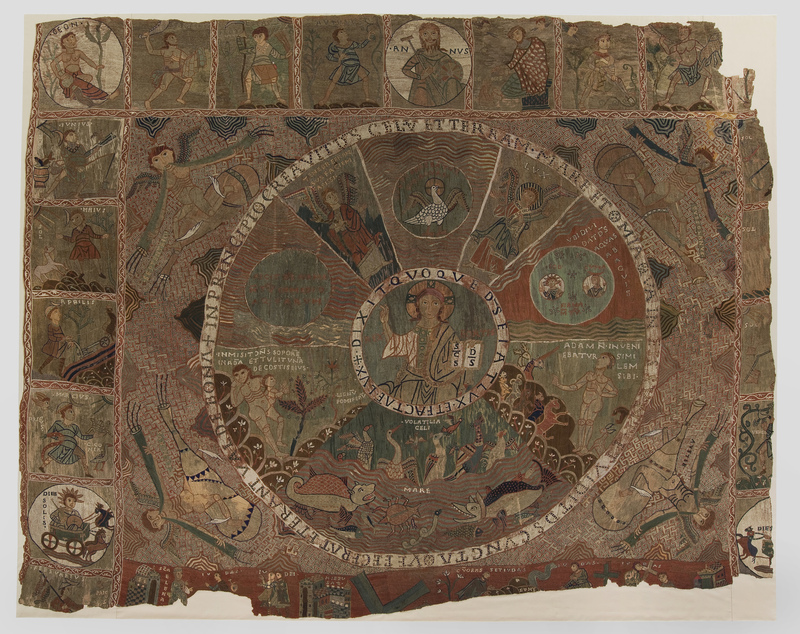 But in fact the image to which the text itself obsessively returns is very different: it is the medieval “Tapesty of Creation” that can be found in the Museum of the Cathedral of Girona. And though almost a millennium of history has done its work to degrade the fabric and the threads that run though it, it is clear that the tapestry was originally a riot of colour: even now the reds and greens and burnished golds stand out. For this is an account of Genesis, not death: a celebration of God’s creation and of the diversity and order that coexist in the world he brought into being. A central panel depicts the Garden of Eden with all the beasts and birds that inhabited it. Around the edges are vignettes of the months and the seasons and the activities characteristics of the various phases of the agricultural year. What is more, and in contrast to the uncanny sense of disquiet and unease that Balet’s image imparts, in the Girona tapestry (as the book puts it) “everything is so disposed such that man should feel in perfect harmony, consubstantial, integrated into the universe, surrounded by creatures both fantastic and real” (20). Descriptions of the tapestry run through the book and seem to offer some key to its structure and meaning. Book and image alike, for instance, offer less of a linear narrative (though there are moments or aspects of linearity, such as the creation story itself and the progression through the year) and more of a patchwork or mosaic of impressions and episodes. They suggest, moreover, that real fragmentation–in the tapestry’s case, the fact that much of the original is now missing–can find compensation in the mind of the active reader or viewer. As the book puts it of the medieval needlework, its “structure [is] so perfect and geometrical, so verifiable that even with almost half of it missing, it is possible to reconstruct the whole, if not on the cathedral wall then within a frame of the mind’s devising” (21). In similar vein, at a number of points Peri Rossi’s book challenges the reader to look for hidden points of order that might help give sense to what is otherwise a fragmentary and sometimes confusing narrative. For instance, the narrator invites “the reader to play a very entertaining game” of figuring out “the true name of the cities evoked” in the description of the principal character’s restless wanderings (37). Indeed, the character himself goes by the name of “X,” as though hinting towards some kind of mystery that the reader might also ultimately solve: X marks the spot of the buried treasure that would be the “perfect harmony” and “perfectly intelligible discourse” (20, 21) that the book claims the tapestry promises the committed viewer. And yet, despite the fact that the idea (or dream) of harmony runs as a leitmotif throughout the book’s disparate parts, in practice there is very little of it to be seen. X himself, for example, is at first sight at least very far from being “integrated into the universe.” Or if he is, then this is a universe characterized more by chance encounters and random violence than by beneficent order. He tries to assert some kind of logic and familiarity to his unsettled drifting by clinging to certain habits of cultural consumption: always buying the same books in each new city he finds himself in, for example. But he is constantly led astray, not least by the women that he meet who can seem at times to be all too reminiscent of the Biblical Eve who likewise turned out to be a disruptive force within the idyll that was Eden. And yet Peri Rossi refuses to condemn Eve (even as she will catalogue the ways in which young children habitually repeat the accusations that it is she who is responsible for mankind’s downfall). In the end, La nave de los locos is rather ambivalent about the so-called harmony that an image such as the Girona Tapestry professes. After all, as a footnote observes, such harmony depends on violence in that “it presupposes the destruction of the real elements that oppose it, and for that reason it is almost always symbolic” (20). This is where a gap opens up between symbolic representation and the real. And X, for all that he sometimes seems–from his (missing) name onwards–to be pure symbol, is ultimately for good or ill condemned to live in the universe of the real. It might be nice to live in the eternal present (or eternal past) of the tapestry’s cyclical, God-ordained symmetry, but in fact we are historical beings, and history’s revenge on such dreams of symmetry can be seen in its gradual degradation, its frayed edges, and the dimming of the colours so that they end up rather closer to Balet’s drained greys than the twelfth-century artisans would have hoped.